The police bazaar street itself tells many things about the place, about the people and about the tradition and culture of the place. The police bazaar street is one of the busiest and crowded streets in Shillong (India), where you can see yellow and black unmetered taxis carrying passengers which defines how busy the street is. On the side of the street we can see fresh fruits, vegetables, poultry etc. which tell us the favorable and suitable climatic conditions of the place and the nature of cultivation. The view of police point from police bazaar is so great which is the center attraction of the street. There are many link roads connected to the street from which we can move on to the different parts of the town. There are many hotels, restaurants, shopping malls in the street and also we can find many people busy buying household items. Centre Point hotel is the center of attraction but Mi-Casa hotel just next to it also very famous. Mi-Casa is a café coffee day/restaurants/Lounge bar with Hookah. There are varieties of hotels which vary with its charge and its facilities. We can find many tourists not only from the different parts of the state but also from different parts of the world. This is what the police bazaar street is. Not only it tells us its importance but also attracts us to visit again and again to have a taste of its changing nature with time. 1. It is busy with people doing business there. Note that the traffic does not seem to be related to people passing through the area as fast as possible, but actually to the activity level within the district itself. 2. There is a great view, which seems to mean to our visitor that there is plenty to see from a central vantage point. 3. Tourists frequent the area, but also the locals shop there. When both types of folks are present, you have a great chance for creating a vibrant and appealing place. If the proportion of tourists becomes too large, people call it "touristy" in a disparaging way. If there are only locals in an area, your community might be missing out on some important tourist dollars. 4. It changes over time. This is an important insight on the part of our visitor. Places are either on the rise or declining almost all of the time. If a street or district remains stagnant, people will tire of it, and eventually it will decline even if it seems extremely successful in the present moment. 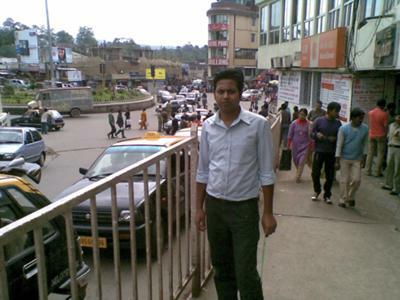 So either through plenty of people activity, which describes this street in Shillong, India, or through deliberate design of the streetscape and rotation of businesses, it is important to freshen up a district or place frequently. Join in and write your own page! It's easy to do. How? Simply click here to return to Best Main Street.